Whether you’re a seasoned social seller or just learning the basics of social selling, these are 5 of the best practices for sustaining a healthy pipeline. Knowing why you should be social selling can be easily explained with one statistic, 72% of sales people who utilise their online profiles outsell their peers. They’re also more likely to exceed their quota and will be even more likely than that to extend their professional networks. So, that’s the ‘why’ but what about the ‘how’? We’ve harnessed our own experiences and looked for some common traps that salespeople have fallen into in the past. Then, we’ve whittled it down to 5 simple steps, including 3 do’s and 2 don’ts. Let’s take a look at these top-level basics that’ll give you a strong footing on your social selling journey. Did you know that simply adding a good profile picture to your LinkedIn account could boost your InMail response by nearly half? How many did you send last week? Would that be a big number? The point here is that more and more buyers are using social media channels such as LinkedIn not just to make decisions about products or services but also about you as an agent. Furthermore, even as civilised and professional people, we’re still ruled by our emotions (especially when buying), which means we will react favourably to what gives us pleasure or makes us feel safe. So, a handsome looking profile with pictures and a well written bio or an empty page with just a name at the top, who will you be most likely to buy from? It’s time to get your public channels looking pristine and ready for any buyer or board level leader to say “Yes!” to what you’re selling. Spend some time researching influencers on the channels you want to spend the most time on in a professional capacity, what is it that makes their page look great? Implement some of these ideas on your own pages. If you don’t want something to be seen by potential customers (for example your holiday snaps on Instagram or Facebook) then it’s probably best to make these pages private too. This may sound counterproductive coming from someone whose job it is to get people sharing. But if you’ve spent valuable time and energy getting your social pages up to their peak, then the last thing you want to do is start filling them with the wrong content or pushing them in front of the wrong people. A major exercise for all brands is building personas for market and user research. Now that you’re in the business of boosting your own personal brand, you should do the same. The good news is you’ve probably already got a pretty good idea of your buyers’ personas embedded in your mind, now get them down on paper and work your social selling strategy out around them. This article from HubSpot has some great advice on persona building, it might seem like something you can skip for now but trust me, you will reap the benefits in the long run if you do it properly. The goal here is to ensure that you get the most value from your activity as a social seller, as a sales person that means high-quality leads that convert more often. How will you achieve that? By putting the right content in front of the right people. As an example, let’s say you want to sell your products to a c-suite purchase leader. We now know that they are almost certain to respond unfavourably if you try to connect with them from the cold. You could boost your personal brand as an expert in what he/she might be looking for, by sharing relevant content that doesn’t just appeal to them but also those around them. This can mean connecting with one of their associates first before encouraging them to refer you. How? Not necessarily by asking, but by providing massive value without expecting anything in return in the beginning. A fully optimised social selling strategy and personal brand are things that take time and experience to build. 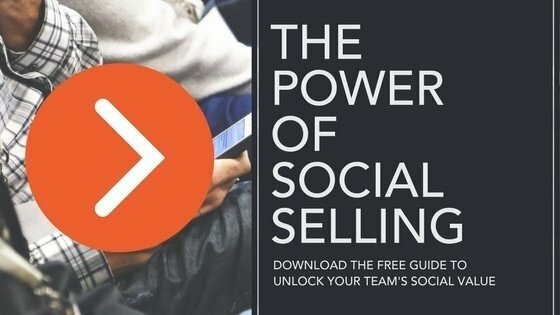 It’s highly unlikely that you’ll make a sale or even a new connection straight away from social selling. But if you have a strategy in place that’s built around validated personas and importantly, fits into your sales journey then you’ll see results in time. Furthermore, you’ll be far better equipped to build trust and create long lasting relationships. Social selling is a great tool for continually learning about your buyer without the lesson always being a rejection call or email. By recognising patterns such as what content works and who with, you’ll be able to make better choices on what you share and how to form relationships. Your aim in the end should be buyers who are awesome leads before you’ve even hit send or picked up the phone. As your personal brand grows, so will your expertise and therefore you value to your company.